Janssen has often been approached about his Segway by fellow students. Many want to know what it is and why he uses it. He got a Segway for easier transportation in the community and it has changed his life. Janssen was born in Romania. He was adopted as a baby and brought to the United States at age one. Janssen was born with mild Cerebral Palsy and has difficulty walking and balancing on his legs. After graduating from Alta High School in 2009, Janssen spent his first year of college at Corban University, a small private Christian school in Salem, Oregon. He wanted to get a taste of being away and get a feel for college life. The Segway is a self -balancing scooter on two wheels. When stepped on, it automatically balances and acknowledges something is there. The Segway costs $4,000 to buy new. Janssen found his used in a warehouse in Colorado for $2,400. The Segway has an electric charge and can travel up to six miles on a 12 hour charge. To charge it can be plugged into any wall outlet and when fully charged a smiley face appears on the handle bars. The top speed is 12 mph. Janssen also has trouble hearing and often uses hearing aids. The Slcc Disability Resource Center provides him with an auditory training device for his classes. The auditory training device is a battery pack device that amplifies sound to better hear the teacher. UTA buses and track stations would not allow the Segway on board. 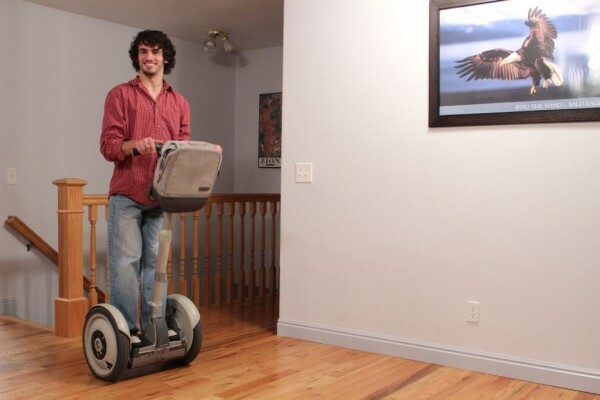 Segway’s first appeared in 2001 when they were unveiled by Dean Kamen, inventor of the technology. Janssen owns the first invention, known as the Segway PT (Personal Transporter).